Since it opened, I’ve been a big fan of Sushi Planet on Adelaide’s West Terrace. Not only is the food delicious and presented beautifully (great for Instagram pics! ), it just happens to be close to my office, and there’s easy parking. I’ve dined in on numerous occasions but I’ve also often taken advantage of their free delivery option. My favourite delivery? Hands down, the Deluxe Sushi Set consisting of 56 pieces of assorted nigiri presented in a large square black box. In fact, I’m such a loyal customer that as a reward, I was invited to try the new menu that they’ve just launched – an offer that I could NOT refuse! Sushi Planet specialises in sushi and yakitori, charcoal-grilled skewers so there’s a good variety of hot, cold, raw and cooked options. There’s nigiri, sushi rolls, soup, rice and both sushi and skewer sets – and to complete the experience there’s a range of beverages including cocktails and sake. This night, chef/owner Chen simply brought out food – no decisions to be made, yay! First, the Deluxe Sashimi Set – a creation with four types of fish – tuna, salmon, kingfish and snapper, all freshly bought in and prepared that day, plus prawn, scallop and tamagoyaki (Japanese omelette). It’s stunningly presented and arrives at the table complete with dry ice theatrics. Next, the ‘Nana’ (seven) – salmon, kingfish, prawn, tuna, crabstick and grilled eel nigiri. That probably would have been enough food by itself, but no – out came a big platter of topped rolls. Aburi salmon, shrimp with avocado, kingfish, and shrimp with mango. And then, just when you’re about to call for the stomach pump, Chen brings out his new signature dishes, unique to Sushi Planet – the Scallop Kataifi and the Shrimp Bites. The Shrimp Bites are pieces of shrimp in an extremely crunchy batter with a miso aioli, coriander, chilli and pepper. The scallops were simply perfection. Meaty scallops in a nest of crisp kataifi topped with flying fish roe and miso aioli. These are absolutely compulsory on your next visit to Sushi Planet. In fact, have these, if nothing else! All up there are 34 additions to the menu which is pretty darn exciting. 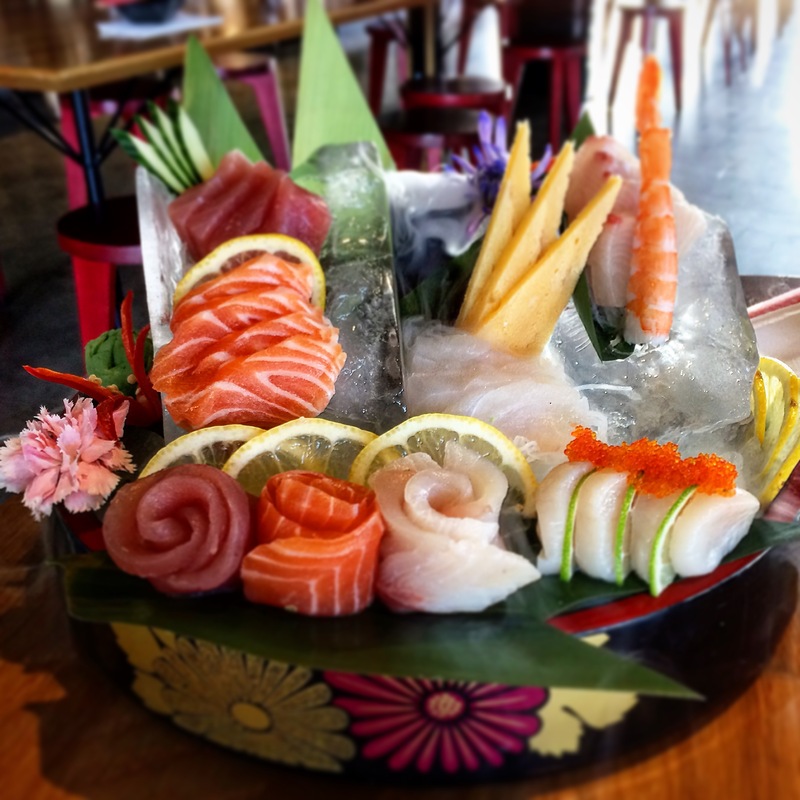 Beautiful food, excellent service and great cocktails – get yourself to Sushi Planet. Agree. It’s the best Sushi Restaurant in Adelaide at the moment. Casual but sleek, stylish decor and relaxed atmosphere. The new scallop kataifi…..wow! A twist from the Greek Kataifi!